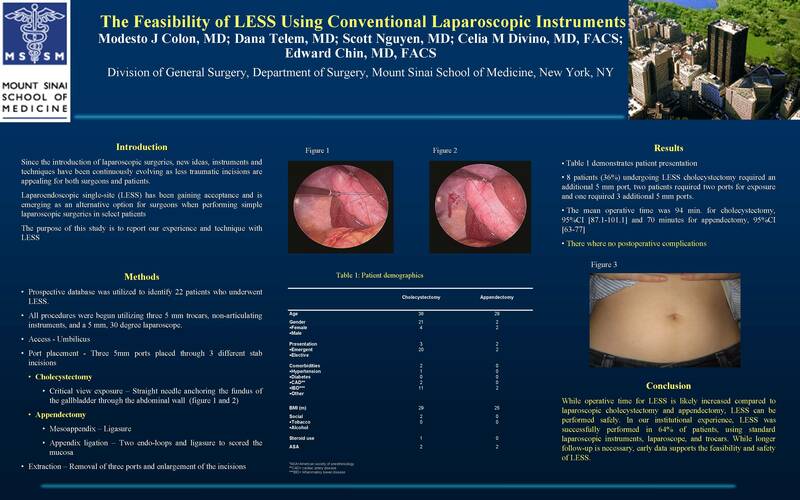 The Feasibility of Less Using Conventional Laparoscopic Instruments. Purpose: To determine the feasibility of Laparo-Endoscopic Single Site surgery (LESS) with non-articulating instruments and conventional trocars. Following Institutional-Review-Board approval, a prospective database was utilized to identify 22 patients who underwent LESS. All procedures were begun utilizing three 5 mm trocars, non-articulating instruments, and a 5 mm, 30 degree laparoscope. Nineteen patients underwent LESS cholecystectomy. 3 patients underwent LESS appendectomy; one for acute appendicitis and two for interval appendectomy. The mean patient age was 35.5, 95% Confidence Interval (CI) [29 – 41.9]. Mean body mass index (BMI) was 28.2, 95%CI [25 -31.4]. Intrabdominal access was obtained by Veress needle in 21 patients, and Hasson technique for one patient. 8 patients (36%) undergoing LESS cholecystectomy required an additional 5 mm port, two patients required two ports for exposure and one required 3 additional 5 mm ports. The mean operative time was 94 minutes for cholecystectomy, 95%CI [87.1-101.1] and 70 minutes for appendectomy, 95%CI [63-77]. 91% (n=21) of patients were discharged within 24 hours. One patient underwent postoperative endoscopic retrograde cholangiopancreatography (ERCP) with stone removal, and was discharged at 48 hours. One patient remained until postoperative day 2 for pain control. There where no postoperative complications. While operative time for LESS is likely increased compared to laparoscopic cholecystectomy and appendectomy, LESS can be performed safely. In our institutional experience, LESS was successfully performed in 64% of patients, using standard laparoscopic instruments, laparoscope, and trocars. While longer follow-up is necessary, early data supports the feasibility and safety of LESS.